1. Anti- rust and anti-corrosion (Stainless steel/Zina alloy/Brass material optional). 2. Famous brand chips--Atmel or P hilips, sufficiently stable, lock can use for 20 years. 3. 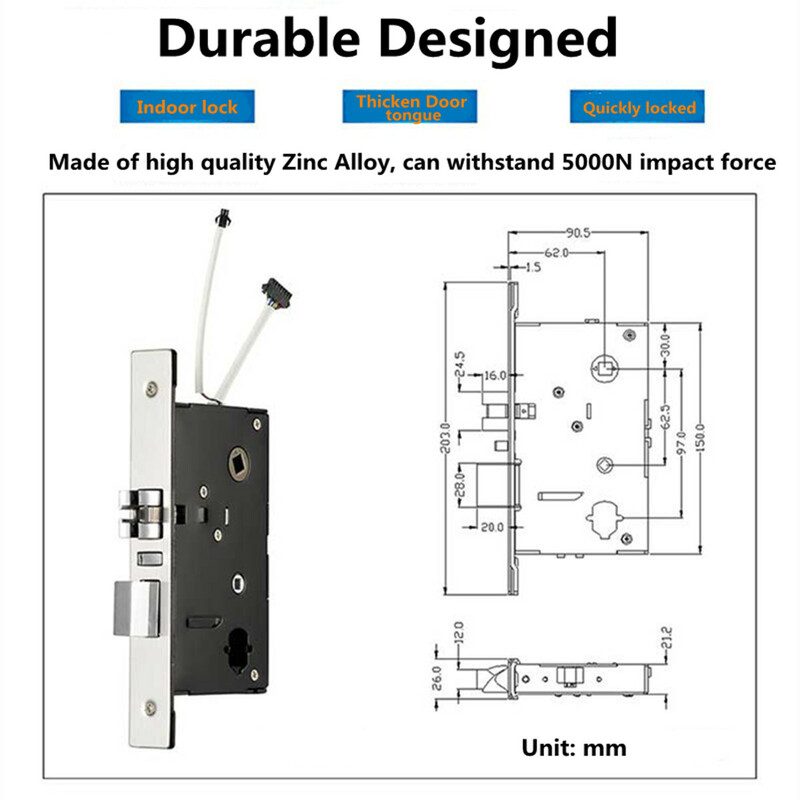 ANSI standard 5 latches lock body ensure security, anti-strike. 4. Data collector can download lock records, eg. when, who use which key open lock. 5. 4pcs AA batteries can use about 10-12 months. 6. Working clock is setted inside locks to control the effective time limit of card keys. eg. if set check out time 11:00AM, pass 11:00AM, guest card can not open door lock. 7. Two unlock ways: RFID card or mechanical key (Master mechanical key optional). 3. Floor card: Hold by clean staff to enter the rooms in one floor. 1. RF Door Lock (qty = guest room)--installed in doors. 2. Encoder (qty=1-2pcs/hotel ) --For issuing/ program all cards to be unlock key. 3. Energy-saving Switch (qty = guest room)--To control power,saving power for you. 4. Cards (qty = 3-5 times of guest room)--be programmed to be the key by encoder. 5. Data collector (1pc/hotel, Optional)--Download unlock records(Who/When open) from lock. 6. Software,English language(free)--For control and management the whole system. SDK support. For other language sofware, you can translate it to be your language.